Dry eye syndrome, or keratoconjunctivitis sicca, is a condition that is pretty much self explanatory. It is actually a very common condition, and becomes commoner with age. It has been estimated that around 14% of adults aged 40 and above have dry eyes. This means that in the United States, more than 20 million Americans are affected by it. It doesn't get any better as you grow older - approximately one fifth of people over 80 have dryness of their eyes. Women seem to be more prone, and are affected about 1.5 times more frequently than men. When you have dry eye syndrome, your eye feels dry. That goes without saying. But you can also experience various other symptoms. For instance, you may feel as though there is a foreign body or grit in the eye. Your vision may actually be a bit more blurry. Your eye may feel scratchy and tired. Paradoxically, you may also experience increasing watering from your eye. Usually both eyes are affected, but one can be affected more than the other. It may sound or seem trivial but severe dryness of the eyes can be difficult to deal with and potentially even cause blindness through corneal scarring. Tears are produced by your eyes for a reason. For several important reasons, in fact. They are not just for displaying your emotions when you are sad or when you are happy. The most important function is in protecting your eyes. Your tears will flush away any irritant, debris and microorganisms that may gather on the surface of your eye. These include any potentially nasty bacteria and potentially damaging chemicals. Your tears also contain important antibodies and cytokines that further help to prevent infection of the eye. As the cornea does not have a blood supply, it relies on the tears to provide it with oxygen and electrolyte nutrients as well as to help get rid of damaged and dead cells. Finally, tears are also important in ensuring that your cornea remains optically clear so that you are able to see clearly. Imagine your cornea as a windscreen, your eyelids as the wipers and your tears as the windscreen wiper fluid. The first thing you'd do when your view is not clear while driving is to wash the windscreen with wiper fluid. A very similar thing happens with your eyes. Tears consists of three layers, all produced by small glands around the eye and eye lids. They are the lipid (oil), aqueous (watery) and mucinous (mucous) layers. All layers are vital for proper functioning of the tears. Every time you blink, the three layers of tears are spread evenly across the surface of your eye. A disturbance in any of the layers can affect the tear film and result in dry eye syndrome. The superficial lipid layer is oily and sits at the top to prevent the tears from evaporating. The oil is produced by the meibomian glands located in your eyelids. The middle aqueous layer is made up of mainly water and electrolytes that are important in maintaining the health of the cornea. It is produced by the lacrimal glands located under your upper eyelids. The base layer right at the bottom is the mucinous layer which comprises mucins. These mucins are proteins that are produced by specialized goblet cells on your conjunctiva. Mucins act as the glue that adheres the aqueous layer to the surface of the eye. They also help the tears to flow across the ocular surface. Dry eye syndrome essentially occurs when your tears are insufficient in quantity, when your tears are not of the right quality or when your tears are not spread across the surface of your eye properly. The causes of dryness can therefore be classified by problems with one (or more) of the following: lacrimal glands, meibomian glands, conjunctiva and eyelids. Lacrimal glands: The lacrimal glands under the eyelids produce the aqueous layer, which is the watery component of the tears. Any disorder that inflames or damages the lacrimal gland will affect the ability to produce the aqueous layer, thereby causing insufficient amount of tears. Inflammation of the lacrimal gland can be due to trauma and medical conditions such as rheumatoid arthritis and Sjögren's syndrome (which also causes dryness of the mouth). A reduction in the corneal sensation can also decrease the stimulation to the lacrimal glands to produce tears. Eyes that are irritated will produce more tears, and so similarly, eyes that have lost sensation will produce less tears. 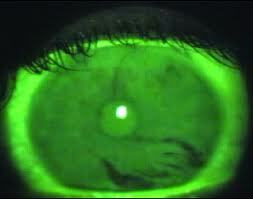 Reduced corneal sensation can be caused by long-term contact lens wear and LASIK. Medications are increasingly recognized as culprits for causing dryness. It is well-known that for certain medications, their side effect profile includes decreasing production of tears from the lacrimal gland. These medications encompass eye drops (such as Brimonidine), inhalers (such as Ipratropium) and tablets (including blood pressure medications such as Bendruoflumethiazide and Atenolol, and antihistamines such as Cetirizine and Loratadine). Always read the information sheet that comes with your medications so that you know of the potential side effects that may occur. Meibomian glands: The meibomian glands at the eyelids produce the oily secretions that make up the lipid layer of the tear film. Inflammation of the meibomian glands, also known as meibomianitis or posterior blepharitis, causes the oil glands to become plugged up. This reduces the secretion of oil that is required to stop the tears from evaporating away. Conjunctiva: Goblet cells in the conjunctiva produce the mucins that make up the mucinous layer. Any condition that affects the conjunctiva can therefore affect mucin production and cause dry eyes. 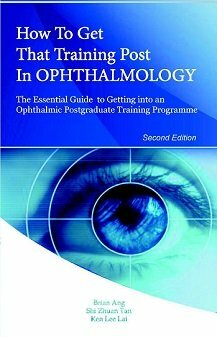 Examples include chemical injury to the eye and vitamin A deficiency. Eyelids: When you blink, your eyelids spread the tear film across the surface of the eye. If your eyelids are unable to do this, there will be areas which will become dry. This is akin to the windscreen wiper not working properly to clean your windscreen. Such eyelid problems can be caused by scarring (such as due to injury, infection and inflammation), thyroid eye disease (where the eyeball is protruded forward from the socket) and Bell's palsy (where the eyelids cannot shut properly). Unfortunately, age is one of the main culprits. Dry eye tends to develop as you grow older as the tear film quality decreases and the eyelids become less effective at spreading the tear film. HOW ARE DRY EYES TESTED? Your ophthalmologist will take note of your past medical history and medications, as well as perform a full ophthalmic examination on your eyes using the slit lamp. During the examination, your ophthalmologist will look for signs of any problems with your eyelids, lacrimal glands, meibomian glands, conjunctiva and cornea. Sometimes, an additional three tests may be performed: tear film break up time, Rose Bengal staining and Schirmer test. Tear film break up time: This tells you how stable your tear film is. 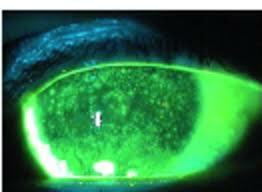 After yellow fluorescein dye is put in your eyes, you will be asked to blink a few times and subsequently to keep your eyes open without blinking - patches or streaks of dryness will appear within 10 seconds after your last blink if you have dry eyes. Rose Bengal staining: This test uses the purple-red Rose Bengal dye to highlight areas of tissue damage on your cornea and conjunctiva. This test is now not commonly performed because instilling the dye into your eye can cause your eye to become irritable, especially when it is already dry. Schirmer test: This test tells you how much tears you produce. Special filter paper strips, some with position markers on them, are placed between your lower eyelid and your eye. After 5 minutes, the filter paper is removed and the amount of tears you have produced can be measured (in millimeters) based on how much of the filter paper has become wet due to the capillary effect. 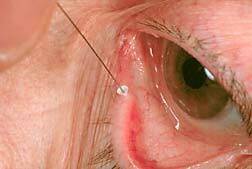 Sometimes anesthetic drops are put into your eyes first to reduce reflex tearing due to eye irritation. 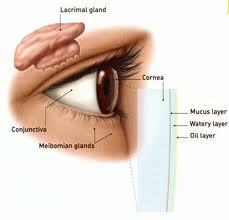 This ensures that only the usual, normal tear production by the lacrimal gland is being measured. There are a number of other investigations that can be performed, but these are usually not done routinely in the clinical setting. Such investigations include blood tests for autoantibodies, conjunctival impression cytology for goblet cell density, tear fluorophotometry and videokeratography. Treatment strategies for dry eyes vary from person to person. Unfortunately, there is no cure and so treatment is aimed at relieving the symptoms of dryness and reducing any potential risk of damage to the cornea. If there is any underlying cause for the dryness, such as excessive contact lens wear or blepharitis, then these have to be corrected as well. Eye lubricants: These come in the form of drops, gels and ointments. Eye lubricants produce the lubrication for the eye that the tear film is unable to provide. There are many artificial tear and eye lubricant brands available over the counter. It is usually worthwhile trying the different ones for at least one month until you find one that works better than the others. In general, you can use the lubricants as many times as you like. Artificial tear drops are useful in soothing any symptoms, but may not last long enough in severe dry eyes. Gels are thicker and will last longer, but can blur your vision somewhat. Ointments will last the longest, but are thick and will definitely blur your vision for that period of time. Ointments are usually applied at night. Punctal occlusion: Your tears are drained from the eye through tear ducts. The punctum is the opening of the tear duct at the edge of your eyelid. You have one punctum each in the upper and lower lids respectively. Occluding the puncta stops tears from draining away so tears stay longer in your eyes. Punctal occlusion is usually performed with punctal plugs (picture above), which are small little plastic knobs that fit snugly into each punctum. Even if you have had punctal occlusion, you may still require eye lubrication for additional symptom relief.